Macintosh drag-and-drop deals with dragging text and graphics from one place to another. But there’s another angle to drag-and-drop, one that has to do with documents and icons. 1. Make a screen shot picture of your desktop by pressing Command+Shift+3. You hear a cute snapshot sound, and a document called Picture 1 automatically appears in your hard disk’s root level window. Assuming that a copy of SimpleText is on your hard disk, SimpleText launches and displays Picture 1. But you don’t want to use SimpleText. SimpleText can open and display a picture file but can’t make changes to it. You want to open the picture with a program that can edit it. What do you do? Use drag-and-drop. 4. Drag the icon for Picture 1 onto the icon of your favorite program. If the icon of your favorite program didn’t get highlighted when you dragged Picture 1 on top of it, or if dragging Picture 1 onto the icon launched the program but didn’t open Picture 1, your favorite program isn’t capable of opening picture files. Your solution if your favorite program can’t open Picture 1: Get a different favorite program. Just kidding. The solution is to try dragging Picture 1 onto other program icons (or aliases of program icons) until you find one that opens it. When you do, you might want to put an alias of that application on the desktop, too. What happens if you don’t have a copy of SimpleText on your hard disk when you try to open Picture 1? 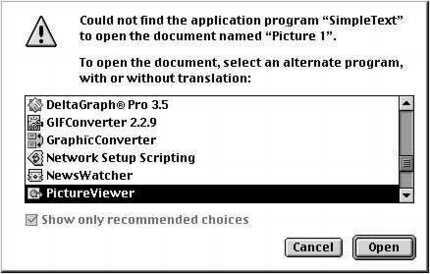 Mac OS File Translation kicks in and offers you a choice of other programs that can open your picture, as shown in Figure 1. Figure 1: Mac OS File Translation lets you choose from compatible applications if you try to open a document created by a program that you don’t have on your hard disk. Suffice it to say that Mac OS 9 is smart enough to figure out which applications on your hard disk can open what documents and offer you a choice. Earlier versions weren’t that smart.